Bertie the Bookkeeper was also having marital problems like Delaney and like him, there were protracted negotiations re family finances. Bertie dealt with the issue by having no bank account and keeping his money under the bed or similar place - Delaney dealt with the same problem differently - he kept his money in the FAI bank account and put some in companies with which he was connected. Delaney's divorce was finalised Jan 2019. Would like to see a Sunday Times interview with the former Mrs Delaney. Who really cares? Irish soccer is shite. Media are all over this and Delaney like they should be all over the government and ministers but never are. Not biting the hand thst feeds them it seems. What about the kicking of balls? Is that not what lies at the basis of this funny discussion? Bit of a balls up for the FAI. I wonder how much they make from attendances. The only time I've seen Lansdowne Rd full in the last few years was when we played Poland in a friendly after the Euros- and it wasn't full of Irish. It was also the loudest it's been in years too, it was basically an away match for us. I remember turning it actually. I am wondering what package Delaney will get for leaving the FAI. 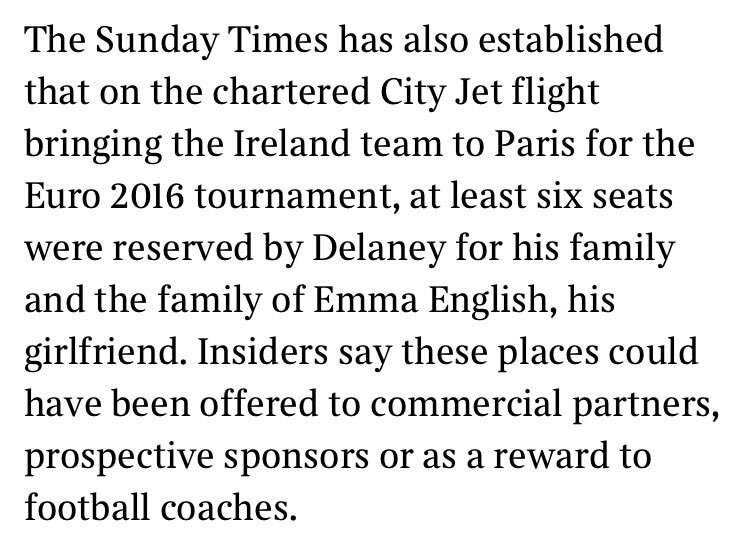 From the Sunday Times article yesterday for just for 6 months in 2016 he OWED the FAI thousands for using the FAI credit card for personal expenses. What would a review of his FAI credit card over the years of his employment reveal? And what were the auditors (Deloitte) doing if this largesse with the FAI card was going on? Delaney is a central factor in the poor condition of Irish soccer. And it is possible to condemn Delaney as well as condemning Veradker etc. Actually not difficult at all. As difficult as spelling the Taoiseach’s name correctly. You have no credibility, dude. Breaking news that FAI auditors Deloitte filed form H4 on april 15 saying FAI in breach of s.281, 282 of Companies Act which relates to keeping proper accounting records. This means directors could be personally liable for missing money etc. Now does this mean trouble for the auditors too? delaney has been there for years so has this accounting records issue only just arisen? The last accounts were to Dec 2017 and signed off summer 2018. How is it the auditors only acting yesterday when its all over the media? I suspect they NEVER looked at Delaney's credit card bills and other expenses. The culchies still love Delaney. even more 'discrepancies' will be unearthed. covering their arses now that the merde has hit the fan!! !